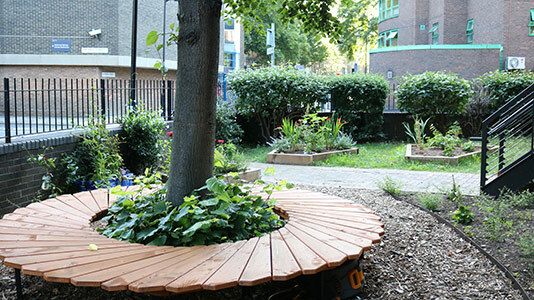 Although LSBU is located in central London, there is still plenty we can do to support local wildlife – we have installed an insect hotel in the new wildlife garden, and are always working to identify new pockets of greenery that we can enhance for birds, bees and other insects. The LSBU gardening club meets every Wednesday at 12.30pm in the Keyworth Street wildlife garden (opposite Keyworth Centre). Recently we have built raised beds, planted shrubs and flowers and commissioned a local artist to build a garden seat. No experience is needed, and everyone is welcome. Please email sustainability@lsbu.ac.uk to book your place. The club is run in partnership with local community charity Bankside Open Spaces Trust. We have installed a rain garden on campus – its clever design captures rainwater and stores it in the base of the flower bed to keep the plants healthy.